There aren’t many homes that will be able to function without running hot water and if your boiler has gone, if your central heating doesn’t seem to be warming up, or if you’ve noticed that the temperature of your water isn’t quite as high as it should be; you may have a problem. 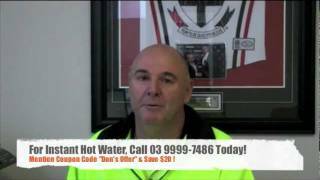 At The Melbourne Plumber, we specialise in hot water services and would be happy to help you today. Our plumbers are fully licensed and offer some of the most extensive experience that you could hope to come across. If your household (or commercial property) is going without hot water, it won’t take long for everyone present to start to suffer. Why settle for cold water when we could get your hot water systems back up and running again in no time? There can be any number of reasons why your hot water may have suddenly stopped flowing as expected. From an issue with your boiler, right through to a blockage in one of your pipes – the possibilities can be wide and varied. When choosing a plumber from our agency, you can rest assured that we’ll consider it our priority to identify the cause of the problem ASAP. Once we know what the issue is, we will then set about rectifying it. We can take care of repairs should any parts have suffered with damage or issues, we will handle any replacements that may need fitting and installing, or we could simply maintain the cause of the problem to get things back on track again. Give us a call today to learn more, for a free quote, or to book one of our expert plumbers in Melbourne.